For the airport in Canada, see Southampton Aerodrome. Southampton Airport (IATA: SOU, ICAO: EGHI) is an international airport in Southampton, Hampshire in the United Kingdom. 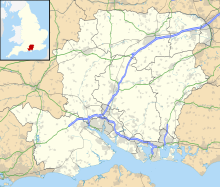 The airport borders the Borough of Eastleigh and is 3.5 nautical miles (6.5 km; 4.0 mi) north-north-east of central Southampton. The airport handled nearly two million passengers during 2016, an 8.8% increase compared with 2015, making it the 18th busiest airport in the UK. Southampton Airport has a CAA Public Use Aerodrome Licence (Number P690) that allows flights for the public transport of passengers or for flying instruction. The airport is owned and operated by AGS Airports which also owns and operates Aberdeen and Glasgow Airports. It was previously owned and operated by Heathrow Airport Holdings (formerly known as BAA). The airport's runway is built over the remains of a Roman villa. It was excavated in May 1925 but the villa had been robbed of much of its material. The site's connection with aviation began in 1910 when pioneer pilot Edwin Rowland Moon used the meadows belonging to North Stoneham Farm as a take-off and landing spot for his monoplane, Moonbeam Mk II. During the World War I, when forces from the United States Navy arrived in 1917, work on the building of hangars began. At the peak of the American presence, some 4,000 officers and men were billeted in tents and huts along the adjacent London to Southampton railway line. After that war, the site became a transit camp for refugees, mainly Russian, who wished to sail to America from the port of Southampton. Shipping companies Cunard and White Star Line (the Oceanic Steam Navigation Company), together with the Canadian Pacific Railway, formed the Atlantic Park Hostel Company to house them temporarily. In 1921 the hangars were converted into dormitories, kitchens and dining rooms. The hostel was intended to be a short-term clearing house for those trans-migrants changing ships, but following changes to United States immigration law which restricted entry under national origins quotas, some residents were forced to stay much longer. In 1924 about 980 Ukrainian Jewish would-be emigrants were cared for at the hostel. Some of them were still there seven years later, stranded between the US and UK which would not accept them, and unable to return the countries they had fled. Atlantic Park had a school, library, and synagogue; the refugees formed football teams that played local sides and took part in local events, such as Eastleigh carnival. At the height of its use 20,000 passed through Atlantic Park in 1928 but then numbers started to fall away, leading to the closure of the hostel in 1931. In 1932 Southampton Corporation purchased the site and it became Southampton Municipal Airport. By 1935, part of the site was being used by the RAF and was briefly known as RAF Eastleigh before it became RAF Southampton in 1936. The military site was transferred to naval command in 1939 and renamed HMS Raven, and spent most of the war in a ground and air training role for the Royal Navy. It passed back into civilian ownership in April 1946. During the 1950s a mainstay of business for the airport was the cross-channel car ferry service operated by Silver City Airways using Bristol Freighters and Superfreighters. In 1959 Southampton (Eastleigh) Airport was purchased by racing pilot J.N. 'Nat' Somers, who laid the foundation for the regional airport that exists today by building the concrete runway in 1963 and negotiating with British Rail to build Southampton Airport Parkway railway station next to the airport. Somers also worked with the Department of Transport to plan for the then-new M27 motorway to pass through the airport just south of the runway and north of Ford's plant, at the same time installing a major roundabout outside the airport. This forward-thinking programme encouraged most of the airlines at Bournemouth Hurn to move to Southampton in the mid-1960s. Somers' company sold the airport to Peter de Savary in 1988, who a few years later sold it to the owners of London Heathrow. In 1936 Supermarine opened a test flight facility on the site, followed shortly thereafter by the opening of the Cunliffe-Owen Aircraft factory on the southern end of the runway. Both companies later closed their Southampton operations, Supermarine moving flying activities to Chilbolton, and the Cunliffe-Owen factory being acquired by Briggs Motor Bodies during 1949–1951 who were taken over by Ford in 1953. The Cierva Autogiro Company rented portions of the Cunliffe-Owen plants from 1946, and had to move to another location on the field when it was acquired by Briggs. In 1951 Saunders-Roe took over the interests of Cierva Autogyro and built a rotor testing building on the eastern side of the airfield, which is now derelict. They continued operations on the field until about 1960. Southampton Airport has one main ground handler, Swissport (Servisair), who took over from Aviance. They handle all passenger services and ramp operations for all airlines except for Aurigny Air services who operate their own ground handling. In 2010, the airport arranged a series of events to commemorate the 100th anniversary of the first flight at the airport. In October 2014, Heathrow Airport Holdings reached an agreement to sell the airport, together with those at Glasgow and Aberdeen, for £1 billion to AGS Airports, a consortium of Ferrovial and Macquarie Group. In 2016 the airport won the Airport of the Year award of the European Regional Airlines Association, having demonstrated extraordinary involvement with the local community and reducing its carbon footprint, whilst growing and expanding in a highly competitive market. The first test flight of the Supermarine Spitfire took place at the airport on 5 March 1936, an event commemorated in 2004 by the erection of a near-full size sculpture of K5054, the prototype Spitfire, at the road entrance. On 5 March 2006, five restored Spitfires took off from Southampton Airport to commemorate the 70th anniversary of the first test flight of the Spitfire. The local council wanted to rename the airport after R. J. Mitchell, designer of the Spitfire. However, the airport owner at the time, Heathrow Airport Holdings, did not agree. Cargo services are available on some passenger flights, including daily cargo services to Guernsey on Blue Islands and to Jersey on Flybe, all of which are handled by OceanAir Express Logistics. Southampton Airport is served by a dedicated mainline railway station, Southampton Airport Parkway. It is on the South Western Main Line from London Waterloo (66 minutes away) and Winchester (15 minutes away) and Southampton (city centre is approximately 7 minutes away) to Bournemouth, Poole, Dorchester and Weymouth with a fast and frequent service to those places. The station is a 60-second walk from the terminal, one of the closest airport links in Europe. Unilink/Bluestar buses run to Southampton city centre every 20 minutes throughout the day and take approximately 45 minutes; taxis are available outside Arrivals. The airport is located close to the junction between the M3 motorway and M27 motorway, giving easy road access to Southampton, Winchester, Bournemouth, Poole, Portsmouth and places between. On 10 June 1990, British Airways Flight 5390 suffered an explosive decompression while flying from Birmingham to Málaga, Spain. With captain Tim Lancaster sucked halfway out of the cockpit, co-pilot Alastair Atchison managed to land the plane safely at Southampton with no fatalities. This accident appeared on the National Geographic television programme Air Crash Investigation (known as Mayday in some countries). "During the final stage of an ILS approach to Runway 20 at Southampton, the aircraft reportedly encountered wind shear and the pilot increased power to compensate for a 10 knot loss of airspeed. The aircraft subsequently touched down some 500 feet along the runway. During the landing roll, maximum braking was used but this appeared to be ineffective and the crew suspected that the aircraft was aquaplaning. Reverse thrust was activated, but the crew received no indication that it had deployed correctly, and assumed that it had not. The aircraft was not stopped before the end of the runway and it overran by some 75 metres onto the grass. The accident happened in daylight (16:16 Local Time) but in poor weather with low cloud and rain, wind 150 degrees at 11 knots. Runway 20 at Southampton has a landing distance of 1605 metres, and a concrete surface. The runway was wet. The aircraft was operating a flight from Istanbul." Damage sustained to airframe: Per the AAIB report "Not reported". However, the aircraft was withdrawn from use and handed over to the fire crews at Southampton Airport for use as a training aid. It has not been burnt, but has been chopped into three pieces by the fire crew's axes, and was described on 23-3-2010 as being in a "poor state"
On 26 May 1993, a Cessna 550 Citation II landed with a tailwind of 15 kn (28 km/h; 17 mph), while the operating manual recommended a maximum safe tailwind of 10 kn (19 km/h; 12 mph); this resulted in a landing distance requirement greater than that available at the airport. The plane overran the runway through the airport perimeter fence and onto the M27 motorway where it collided with two cars and caught fire. The two flight crew sustained minor whiplash injuries, and the three car occupants also sustained minor injuries. The aircraft was destroyed. ^ "Southampton International Airport Ltd". Companies House. Retrieved 22 January 2019. ^ a b c d "Aircraft and passenger traffic data from UK airports". UK Civil Aviation Authority. 3 March 2017. Retrieved 15 March 2017. ^ Mann, John Edgar (2002). Book of the Stonehams. Tiverton: Halsgrove. p. 25. ISBN 1-84114-213-1. ^ "Centenary of flight". Hampshire County Council. 28 January 2010. Archived from the original on 21 October 2010. Retrieved 27 February 2010. ^ "Southampton Airport flying high after being awarded as the best in Europe". Daily Echo. 18 October 2016. ^ "Travel to Southampton city centre". Retrieved 17 January 2014. ^ "Report on the accident to Cessna 550 Citation II, G-JETB at Southampton (Eastleigh) Airport on 26 May 1993". UK AAIB. Archived from the original on 22 October 2008. Retrieved 7 April 2008. This page was last edited on 3 April 2019, at 12:38 (UTC).